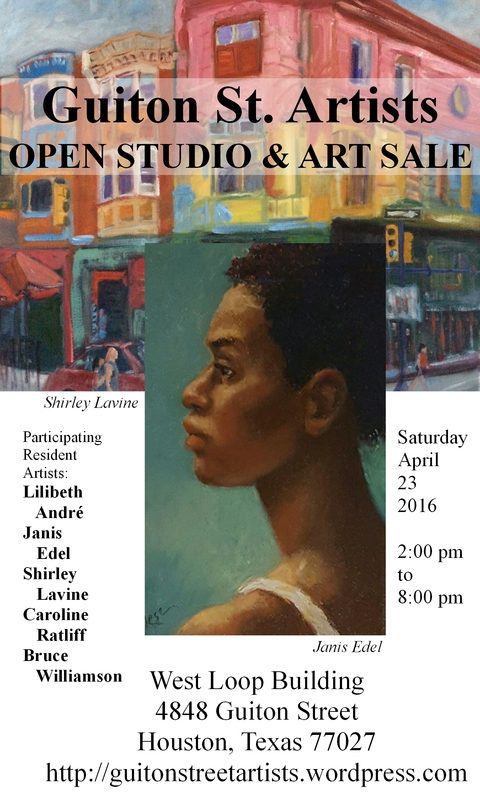 Open Studio & Art Sale, Saturday, April 23, 2016, from 2:00 to 8:00 pm, at Guiton St. Artists, located in the West Loop Building, in the Galleria Area. What could be a better way to spend your Saturday afternoon and evening than to enjoy fresh new art by contemporary living artists in their Houston studios, in The Galleria area, and the relaxing music of Jim Dannemiller (aka as Jimmy Dan). The 2016 Open Studios and Art Sale will be the only open studios event this year. Doors open at 2:00 pm and kick off with Jim’s performance. The music ends downstairs at 3:30 pm and we move upstairs to visit the artists’ studios. This is Jim’s second visit to the Guiton St. Studios and we are very excited he will be sharing his soothing and soulful sound with us. You don’t want to miss sweet music and beautiful artwork. Meet the artists and enjoy your Saturday.